Mogoeng used this quote as evidence that South Africa’s rapid decline toward failed state status since the end of Apartheid is the fault of white people. Some may be skeptical of the veracity of the quote. But there is photographic evidence that Macaulay really said it. There is also photographic evidence that Macaulay said the exact same thing, except about India. 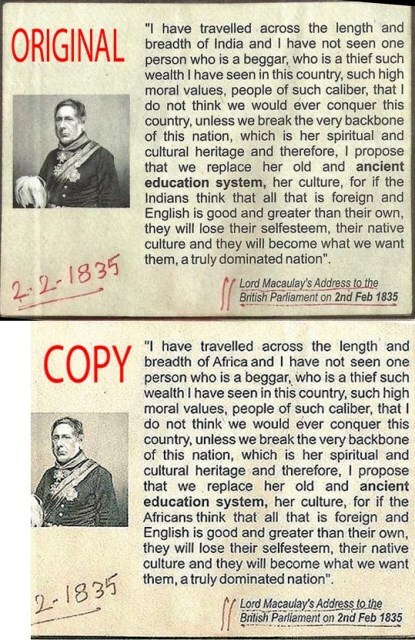 Actually, Macaulay didn’t spout this nonsense about Africa or India. He wasn’t even in England when he supposedly made his speech before Parliament. See Politicsweb for a thorough debunking. Mogoeng Mogoeng may not be the sharpest spear in the hut, but let’s given him credit for knowing that the quote is implausible. That way, we can add him to the Hate Hoax List.